This is the clock that started it all, the Heathkit GC-1005 Digital Alarm Clock. I build one back in the mid -70's but unfortunately I no longer have it. 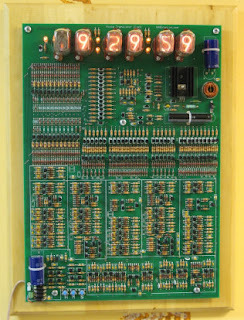 Picture from "Tom McNally's Cool Clocks"
This is the clock that restarted my interest in micro-controllers. I found it while reading a Slashdot article about open source hardware. Since you can not have enough clocks, I got this next. But it doesn't stop there, another clock was added to my collection. Then Sparkfun free day came along and I won $20! The display has an ATMega328 which controls all the serial communications and the 4-digit 7-segment display. Mmmmm, I can re-purpose it and make it a clock! The ATMega328 on this device did not have an external crystal and instead uses the built-in 8MHz oscillator. Because of this the time keeping was unstable. 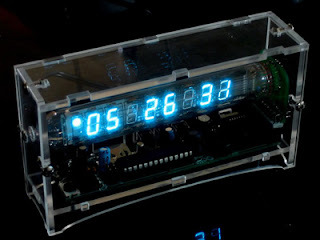 I connected the RF Transmitter to my Ice Tube clock and the RF Receiver to the 7-Segment display. The Ice Tube clock transmits time on the hour keeping the 7-Segment Display clock in sync. Add the call to time_braodcast_init() before the while(1) loop in main(). I started thinking that clocks are taking over my life, so... I built a clock that plays life! 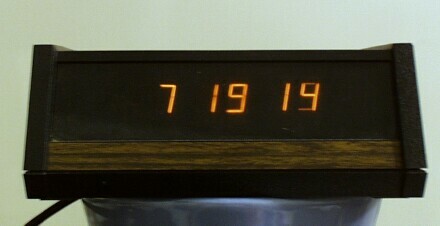 I modified the Adafruit Monochron clock code with changes I made to David Gustafik's work. You can find the details about this modification in my May 7, 2011 blog post. 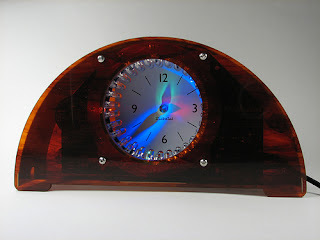 So for Fathers Day I got the Nixie Transistor Clock which can be found on the Kabtronics Website. You can find the details about this clock in my August 11, 2011 blog post.